Sorry this picture is not the best. I took it with my tablet and my tank needs a good cleaning due to algea. 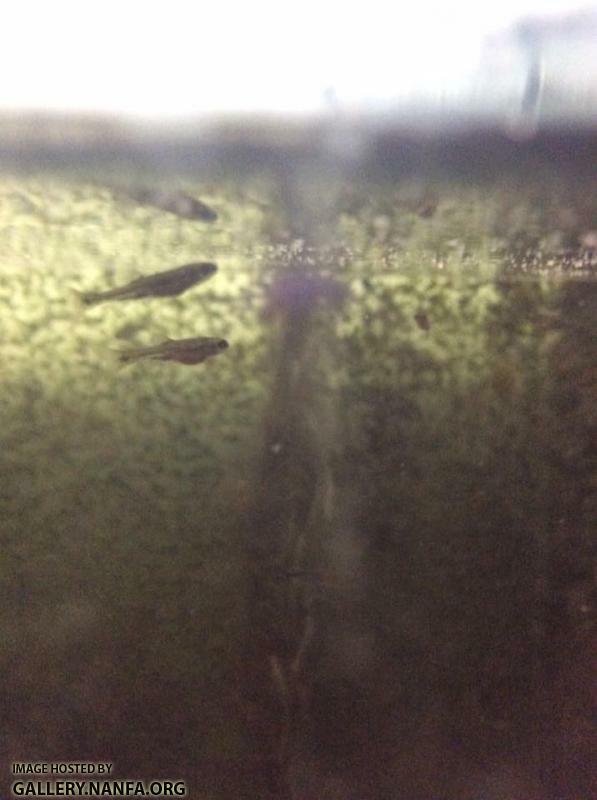 But today I noticed baby fish in the tank. Not sure whose babies they are. The tank has a few longnose, blacknose, and northern redbelly dace, a golden shiner, maybe a lake chub or two, and a very lazy algea eater. Awesome! Those are some of the best types of surprises! Whoever they are, they sure have happy-lookin' tummies! I'm betting nrbds, but for no other reason than they have a stripe and aren't on the bottom of the tank. Very cool. Let us know what they are when they grow a little more. Cool, Josh maybe a black longnose redbelly dace. I put a floating (due to losing the stand) plastic plant from another tank in their for cover. I worry though that the parents will eat them. As of the other day I had about 4 or 5 of them.. Technically my other tank has 4 fish I could move to make room for them, but chasing fish with an aquarium net is a major pain. Edited by FirstChAoS, 16 May 2017 - 08:04 PM. I'd separate them one way or another, I've seen black nose dace eat smaller fish northerns not so much.